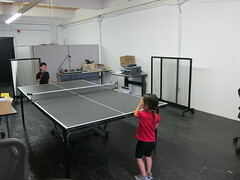 We inherited an old table tennis table from our old office neighbor. Certainly add fun and exercise to the workplace. Our space better? Or google Stockholm better? You be the judge. I have put up construction pictures for Gateway Terrace, a new loft community in Boston, here. Fun to watch as the construction progresses. I flown from Tokyo to HK many times, and this is the first time that the Pilot made an annoucement which let me capture this picture of the top of snowed capped Mount Fuji ! !